O Dreamland is a short documentary film made in 1953 by just the director Lindsay Anderson and a cameraman and is about amusement park Dreamland in Margate. 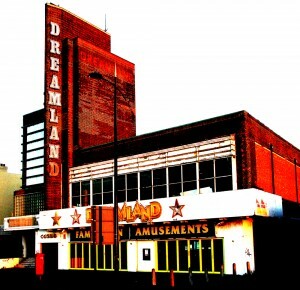 The film takes the audience on a tour of Dreamland in Margate and its various attractions such as bingo, arcades, rides, café and mechanical puppets set to background noise and music. The 12 minute film was made with basic equipment – a single camera and an audiotape recorder and after completion it was shelved and likely never to be shown however Anderson decided to screen the film as part of the Free Cinema programme. Dreamland has been closed since 2006 but there are redevelopment of the site is being undertaken with plans to re-open in 2014. Margate is a delightful seaside town with a sandy beach, harbour, arcades, galleries and period housing. Margate has become a popular location having previously welcomed productions such as Sky Atlantic drama The Tunnel (2012), BBC One’s improvised drama True Love (2012) and feature film Last Orders (2002). This entry was posted in Filmed in Kent and tagged Dreamland, Margate, O Dreamland film locations, short film. Bookmark the permalink.